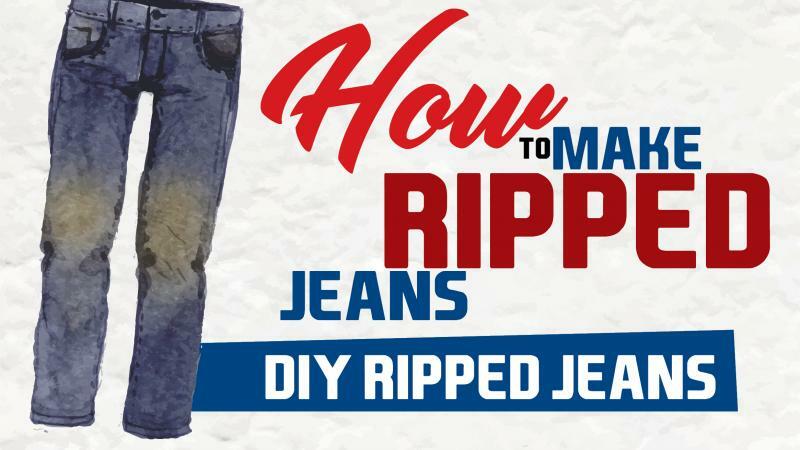 How to make ripped jeans is a question every teenager thinks of. Ripped jeans never go out of style and fashion. Undoubtedly, they are the most talked about among the youngsters. They are trending for a simple reason that we all love them. Everyone wants to have at least a pair of it to match with the fashion trends. They are all over the place and we just can’t get enough of them. The thought of ripped jeans was earlier only associated with celebrities and runway models. Many of us may not be aware of the idea of ripped jeans. The regular jeans that has either some rips, shreds, fades, frays, scrapes to it and give a ripped or distressed look are the trending ripped jeans. We can observe them on celebrities and some mannequins in the stores or malls. In simpler words, to answer the question of how to make ripped jeans, it can be done by roughing up fabric with a piece of sandpaper and snipping a hole with a pair of scissors. You can also use contrasting shade jeans and bleach it in order to fade it out. Everything worth having comes with a price, but why should you pay the extra cost when you can easily rip it at home. Yes, you read that right. Fortunately, now you can create this trend for yourself without even spending a penny. If you fancy a pair of ripped jeans and for some reason cannot afford it, you can definitely make one which is inexpensive in its nature. Wondering how to make ripped jeans? Well, it is not a rocket science and you can definitely create it on our own with some simple steps by affordable tools. All you need is some planning, practice and patience. How to make ripped jeans? Well, if you are thinking of how to rip your jeans, you will need to follow some simple DIY ripped jeans steps in order to get ‘homemade’ pair of ripped jeans with an inexpensive method. Most of us, who are not well aware of these steps and are still lingering into the thoughts of how to make ripped jeans? Well, DIY ripped jeans is the answer to it. The most important element on your items list are your jeans or shorts that you wish to rip. They can be old but most importantly should fit you well. You would not risk an expensive pair of jeans that could possibly be your favorite. Plus, the already worn out jeans have slightly distressed outlook and can bring about the preferred contrast shade. Pick a spot you want to rip and start marking that area. The spot you choose is an important step in the process. If the spot you choose is not appropriate, it may screw up the whole thing. Hence, clear your mindset with what exactly you wish to do with your jeans and then mark the spot. If required wear your jeans and make a rough figure of how you actually want to see it in a ripped design. This is an effective way to get an idea of the spot for marking. The spots you have chosen can be ripped with sandpaper, razor, pumice stone or steel wool. The area will thus weaken and it will be easy to rip them. Before cutting, don’t forget to keep a wooden block, cardboard or anything solid between the lower layers and upper layers of your jeans. Start tweezing out the vertical blue threads off the patch you have marked. Initially, removing first few threads will be difficult but later on it will loosen up as you carry on with the process. Try to do it manually to give it a natural look. Here, your ripped jeans are ready to rock and roll! You can also make it better by choosing the best quality of fabric from an online fabric store. It will provide you with a larger range for selection, discounts and designer fabrics. You will get a number of variety in prints and choices in fabrics and colors through online fabric store. If you are already an expert or a fashionista and wish to make money by showcasing your talent, you can sell ripped jeans. There are a number of ways through which you can make a fortune. You can do just anything about your ripped jeans and can sell them for profit or make them yourself and wear them whenever and wherever you want to.